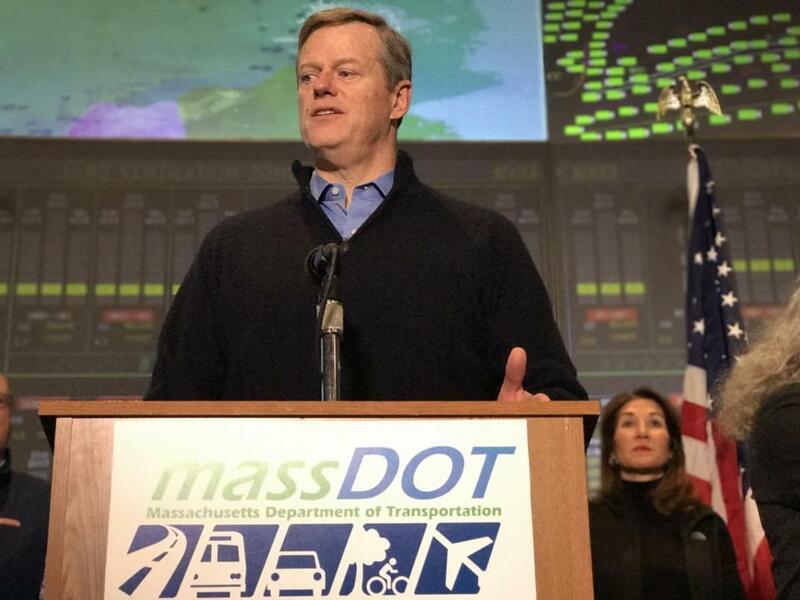 Governor Charlie Baker spoke Tuesday about snow at the state Transportation Highway Operations Center in Boston. The cast was in costume just after sunrise Tuesday. The governor of Massachusetts in his navy sweater, primed to speak about snow volume in a sturdy monotone. His chief lieutenants for transportation and energy, ready with statistics about the state’s meticulous preparation. A bank of TV monitors, blinking technological gravitas. Like all theatrical stars, governors who don pullovers and vests for storm news conferences know they could face cheers and praise for their strong, steady performances — or harsh criticism and ridicule for pushing the drama too far. Each is a high-stakes political moment as a blizzard or hurricane bears down and residents look to their elected leader for guidance. John H. Sununu, the former New Hampshire governor and father to the current one, said the weather makes for really difficult decisions. An added challenge, Sununu explained, is that state executives are advising the public on what they should or should not be doing based on “third- or fourth-hand information about the weather” from agencies they don’t control. Eric Fehrnstrom, a longtime adviser to former Massachusetts governor Mitt Romney, said people like to know that their chief executive can handle an emergency. For presidents, that usually means a foreign crisis. For governors, it’s often weather emergencies. He pointed to one of the campaign kerfuffles during the 2016 race for the GOP presidential nomination. New Jersey’s governor, Chris Christie, faced blowback for campaigning in New Hampshire as a snowstorm barreled towards his state. “The best way he could prove his presidential mettle was not with another town hall meeting in New Hampshire but by actually being home and managing a crisis in real time,” he said. Christie — who once warned residents to “get the hell off the beach” before a 2011 hurricane — eventually relented and returned to New Jersey. Optics of storm announcements are key, too. Many governors speak from their state’s emergency management agency headquarters. They are often flanked by public safety, transportation, and other officials, conveying a unified, united front. And they usually dress down. New England governors took different approaches to Tuesday’s storm. Despite the impending snow, New Hampshire’s governor, Chris Sununu, urged local officials to carry on with planned municipal elections. Connecticut’s governor, Dannel Malloy, took a different tack, banning most motor vehicle travel in the state from 5 a.m. to 5 p.m. Tuesday. Baker, with some parts of Massachusetts facing much more snow than others, seemed to fall somewhere in between his fellow chief executives in New Hampshire and Connecticut. He shut down state offices for the day but didn’t shut down the highways. At a noon news conference at the Massachusetts Department of Transportation Highway Operations Center (his fourth time facing the cameras in 24 hours), Baker was asked whether he regretted the move, given the dissonance between original forecasts and actual Boston-area snowfall. The governor replied he did not. Since most school systems were closed and Massachusetts encouraged employers to let workers do their jobs from home, Baker said it was the correct call to shut down government offices. “I think that was the right decision for us to make,” he said, just after a plow chugged by on one of almost 40 monitors above him, showing snowy highways across Massachusetts.